I’m a horrible, grouchy person when I don’t meal plan. And that’s the God honest truth. It could be the three (soon to be four!) little ones that are pulling on my apron strings asking me what’s for supper. I don’t know! Don’t ask me! Evil children! I kid. But frankly, when I KNOW what’s for supper, I can PLAN what’s for supper, and I’m PREPARED to make supper, I’m in a much better place than what I like to call “the five o’clock angry stare“. You know what I’m talking about. When you open the refrigerator doors, give it the stare, and wonder why a magical culinary fairy doesn’t pop out to do your bidding. And what do you do when she doesn’t come? You order pizza. Or eat a questionable piece of chicken leftover from last week. People often ask how I manage to put real meals on the table multiple times per day – planning and inspiration make it possible. 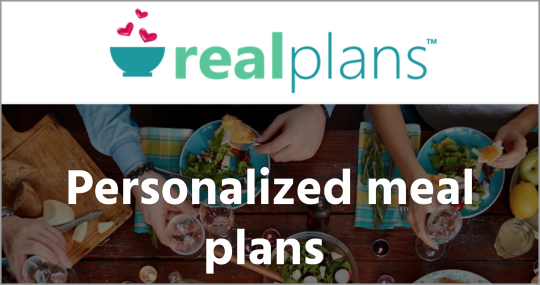 Real Plans offers both! While they don’t offer any magical fairies, but they do offer peace of mind. To be prepared for supper time (and lunch time! and breakfast time!). This is huge. Because eating good food should be easy and uncomplicated. And Real Plans makes it so. They send you the recipes, based on preferences of your choosing (traditional, dairy-free, gluten-free, primal, paleo, vegetarian, you name it!). On top of that, they will change the recipes automatically based on how many mouths you’ll be feeding. You’ll also get a timeline of what to do and when so that you’re always proactively prepared for the next meal! Can I get an AMEN? They send you the grocery list, based on the recipes. You get to enjoy a week of perfectly healthy and planned meals. No fuss, man. And come on, the complete meal plans start at just $6/month. That’s, like, a bottle of dressing. Or a bag of Doritos. Put down the junk, go to the store with a wholesome, complete list and a plan! No more excuses. You won’t be experiencing the “five ‘o clock angry stare“. You won’t be kicking yourself for not having a grocery list (which, we always know, results in a much bigger grocery bill!). You’ll simply be preparing easy and delicious meals for your family. That’s the easy and fun part! I invite you to take a peek at Real Plans. Give it a try for you and your family. We use (and love!) it. Want to see Real Plans in action? Take a peek at this video that explains exactly how they work.